Well, not quite. As of the second day of the Duterte presidency, at least 12 drug suspects have been killed across the country, many of them reportedly shot while resisting arrest. One was killed and left in a ditch in Tondo, Manila. 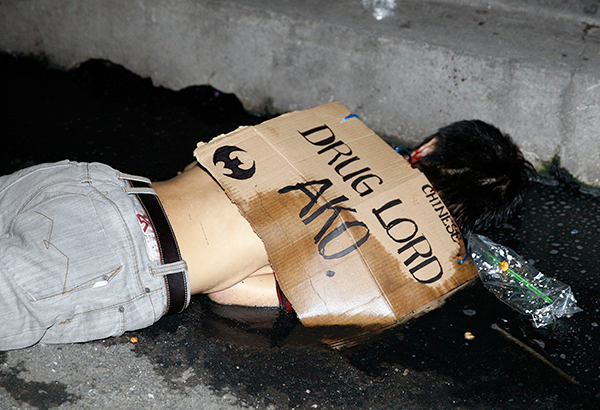 On his body, a cardboard sign identifying the dead man as a Chinese drug dealer. On one corner of the cardboard sign, Batman’s bat symbol is inked in permanent marker, perhaps as a bona fide that the man who died was indeed a criminal. Duterte supporters will say that the deaths cannot be blamed on the president. He did not, after all, pull the trigger himself. Nor did he give specific orders, at least not in a way that has a paper trail, to kill drug personalities. He repeatedly spoke about it in his speeches, but, as his supporters say, those are just soundbites and that is simply how he talks. Indeed, the links connecting Duterte to the deaths are as tenuous as those connecting former President Benigno Aquino III to the deaths of more than 60 Filipinos — but, really, most people only count the 44 police officers among them — in Mamasapano, Maguindanao in 2015. This has not kept some Duterte supporters from cheering on the deaths of these supposed drug dealers and distributors. For many of those, that is precisely why they voted for the Davao City mayor: to rid the streets of drugs and crime. Surely, as the man in Tondo who was killed by Batman, the only ones who will die are those involved in the drug gangs and therefore had it coming anyway. Duterte supporters, chief among them Senator Alan Peter Cayetano, have repeatedly said that if one has done nothing wrong, then there is no reason to fear. For Duterte supporters, many of whom come from the upper and middle classes according to pre-election surveys, this is undoubtedly true. After all, no rich people use drugs and even fewer than none are involved in the drug syndicates. At least, going by the deaths so far. We are all still alive, right? And that is at the heart of why the uproar over the extrajudicial deaths has been faint. Aquino’s quote, which his critics repeatedly used to highlight his supposed lack of empathy for the people, was directed at a Tacloban City businessman who raised concerns about looting after Typhoon Yolanda. The man has since died and it would be poor form to dispute his claim of being shot at by would-be looters, but the reports were, to be generous, exaggerated. Emergency responders who went to Tacloban and to other parts of the Eastern Visayas did not validate the reports and according to people on the ground, a video of residents swarming inside a shop in typhoon-hit Leyte province was not evidence of looting. The store had opened its doors because the goods would have spoiled from the lack of electricity anyway, people who were on the ground after Yolanda said. This drive against drug dealers and the dregs of society is similar in that it is a call for the state to use security forces against a valid if likely exaggerated threat. There is no outcry over the deaths of these drug dealers — and we have pretty much accepted that that is what they were despite no court saying so — as there likely would not have been any over supposed looters killed after Yolanda. Neither will there be much vocal opposition to the reimposition of the death penalty, which Duterte wants and for which bills have already been filed at the Senate and House. It will not matter that the death penalty is outdated, is ineffective as a deterrent to crime and is unfairly stacked against the poor, who cannot afford the legal options to keep them out of the lethal injection chamber or, if Duterte gets his wish, away from the gallows. After all, we’re all still alive.